An Indestructible dog bed could be the blessing that could help you with the destructive behavior of your dog. Dogs are usually referred to as “man’s best friend” for many reasons but the one that stands out is the companionship they offer their owners. It is common to find dog owners spending time and money to make their pet’s lives as comfortable as possible as a way of giving back to them for their loyalty. Some of the ways to express love to your dog is by making sure that they have a good rest whenever they need it. For this to happen, you will likely need to invest in a good bed for them and one that meets their needs. Fortunately, there are a number of dog beds available from pet stores that are ideal for most dogs and affordable too. Nevertheless, it is good to be aware of the destructive nature of dogs when it comes to their personal items. Many dogs will chew, scratch, rip, bite or even defecate on their beds resulting in their damage within a few months or even weeks of their purchase. It is for this reason that many dog owners are investing in indestructible chew resistant dog beds, which are known to withstand many of the destructive activities that dogs do on a regular basis. These beds are ideal for most dogs and have been built to be durable and comfortable for them. If your dog is damaging the crate too, and you are looking for a heavy duty crate, we have got you covered with our guide on top 5 indestructible dog crates. It is a fact that dogs have destructive behaviors that are part of their nature and thus cannot be wished away by pet owners. Most times, dog owners do their best to minimize the effects of the bad behavior so that they can enjoy the good times they have with their pet. It is for this reason that items such as chew proof beds have been made for dogs so that they can rest well without destroying their sleeping area. Although, the majority of the sleeping products available for dogs are referred to as beds, there are some that are cots because of their overall design. When compared to beds that are usually placed on the floor when spread out for use, cots are a bit more elevated which keeps your dog from getting wet when it rains and dirty when spending time outdoors. On the other hand, there are cushion beds that mostly focus in keeping the dog as comfortable as possible while at the same time providing orthopedic support. These dog beds are made from a variety of materials that can be able to withstand the different destructive habits that are common with dogs. The materials used in their structure and design have been specifically chosen to balance between comfort and strength so that your dog can use for an extended time period. Majority of the materials used are strong, waterproof, dirt resistant, odor resistant, hypoallergenic material and offer orthopedic support to the dog among others. It is also possible to find these dog beds made from recycled material but still of very good quality. Furthermore, the beds can be used indoors as well as outdoors for the benefit of the animal. Even so, it is good to note that the best indestructible dog beds can be a bit costly but the benefits are worth it in the long run. 100% Microfiber cover that is machine washable. Available in Large, XL, and Giant sizes which are specially designed for big dogs. Made with high quality American foam that will not flatten over time. They also have an edition for small and medium dogs which has all the same great features but just smaller in size. 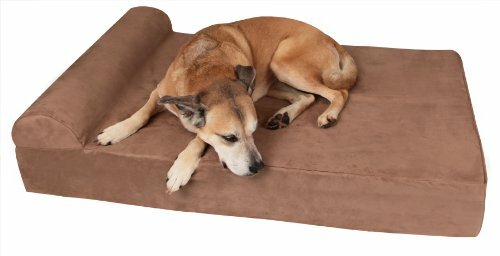 It is an orthopedic dog bed which means great support for your dogs joints. This is extra large dog bed will be able to hold all the weight of your pet and still keep them comfortable whenever they sleep on it. It has been recommended by many dog trainers as one of the best orthopedic beds in the market and a good investment for pert owners. The main advantages of the bed is that it has been constructed using quality materials such as American foam which helps it retain its shape and also provide support especially at the base of the bed. The company pet support systems also has some good quality dog beds for smaller dogs. inside the home. It is made from one of the toughest materials in the market which include a Velcro closure of industrial strength which can be found under the bed. The corners of the bed have also been reinforced with ballistic material to make them stronger making it hard for any dog to chew through or damage. This bed can be used by both big and small dogs that have a habit of chewing as it can resist the damage often caused by the activity. This bed is ideal for light to moderate chewers. For heavy chewers, I would recommend some of the other tough beds mentioned in this article. This indestructible bed targets pet owners that are looking for an affordable yet high-quality sleeping product for their dogs. The bed is made from quality material and provides comfort to the dog regardless of their size because of the use of good quality foam in its construction. Also, the double layer of fabric used in its construction reduces the chances of it getting damaged by water or any other types of dirt which makes it quite ideal for dogs which can at times engage in destructive behavior while on the bed. If you have a dog that persistently chews on anything they can get their paws on, then this is one of the ideal beds for them. For most dog owners, this cot is considered to be their last chance at getting a good bed for their dogs that will withstand constant chewing and last for an extended time period. In addition, cleaning it is easy whether it has been used indoors or outside. The Cujo cot is available in different sizes namely small, medium, large, extra large and extra extra large. It can also be bought in a variety of colors such as blue, black, green, red, tan, marine blue stripe and sunny sky stripe giving pet owners an opportunity to buy the one that fits the needs of their dog. I personally love the green one. It looks great and is dark enough to hide any stains. However, the only downside to this dog bed is that it is not as comfortable as the other indestructible beds mentioned in this article. Overall, finding the best indestructible beds is possible but will need a bit of effort to decide on the best one for your dog. There are a number of online stores as well as those at physical locations that have them on sale, making it easier to browse through what is available and make an informed decision before purchasing. We have reduced the burden on you by doing the research part and selecting the best options for your Fido. All you need to do is select the one for your needs. All the best!